We could smell the heavy, musty scent of the flowering Durian (Durio zibethinus) as we approached our orchard last evening. We only have 4 trees but they are laden with flowers and attracting quite a lot of attention, especially at night. 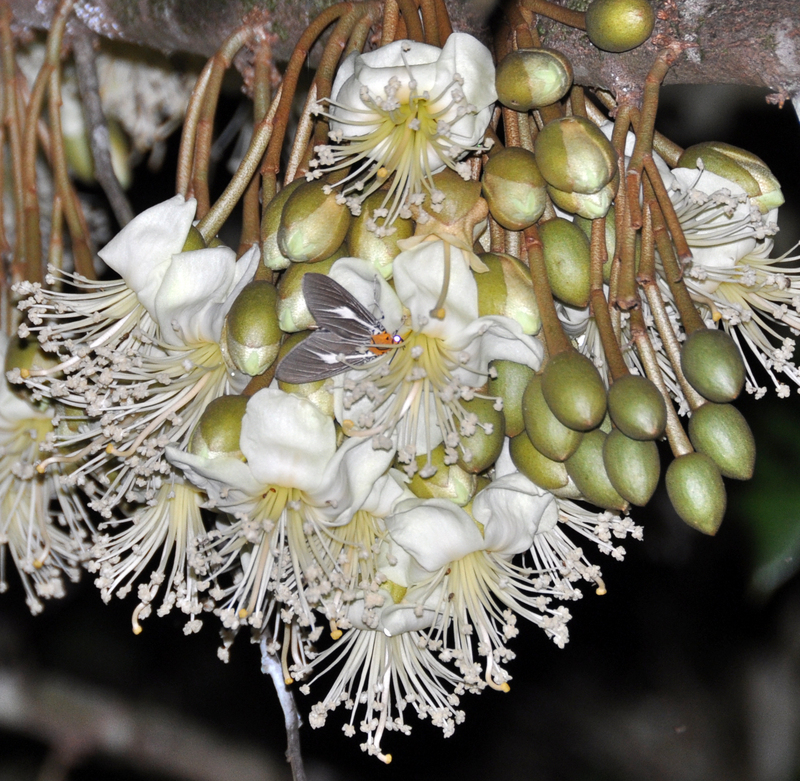 This photo only captures a portion of the tree with flowers in various stages along the main and smaller lateral branches up to a height of approximately 10 metres. As well as many blossom bats (possibly Northern Blossom Bats but we haven’t a positive ID), there are moths and beetles attending the flowers at night. The flowers open from mid afternoon to late evening with most pollen being shed before midnight and all flower parts excepting the pistil fall to the ground. 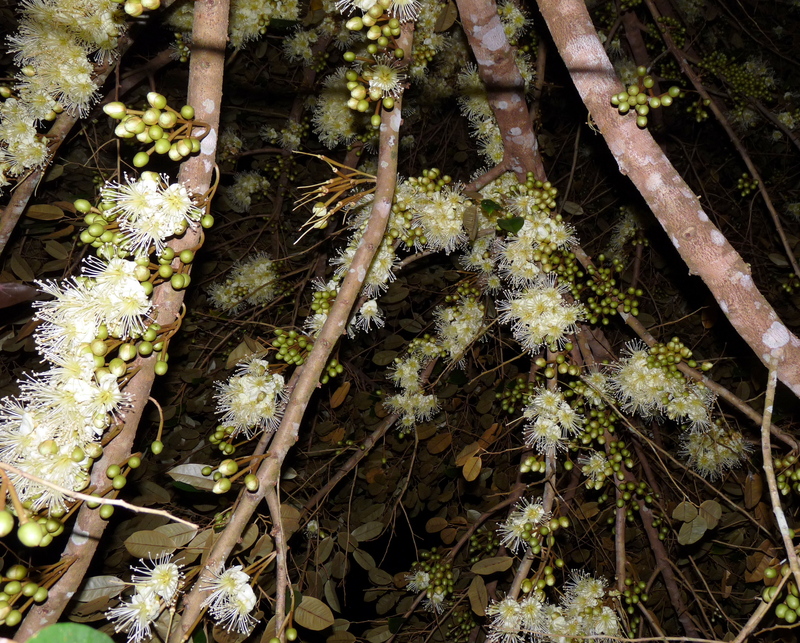 We walked under a tree and shone our headlamps upwards to watch the diminutive blossom bats flitting in and out, hardly seeming to stop on the flowers. 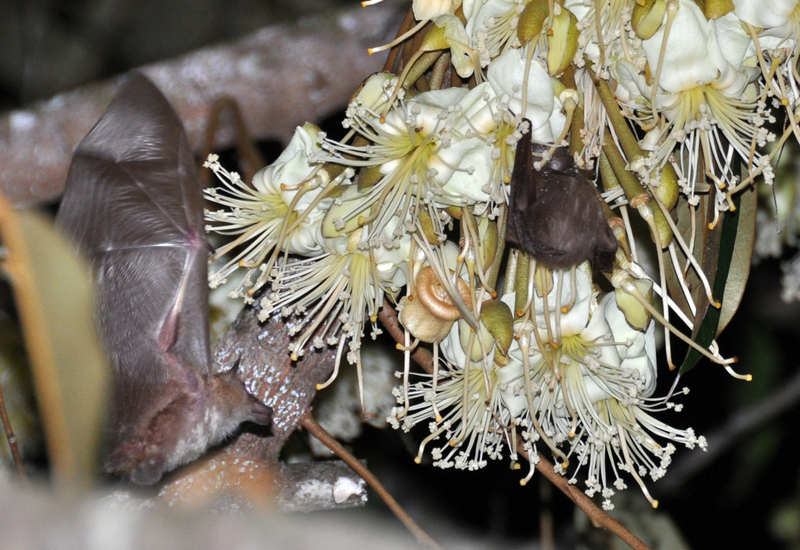 Blossom bats make a ‘kissing’ sound and when I imitated them I would have them swooping really close so I could feel the air movement from their wings on my head. 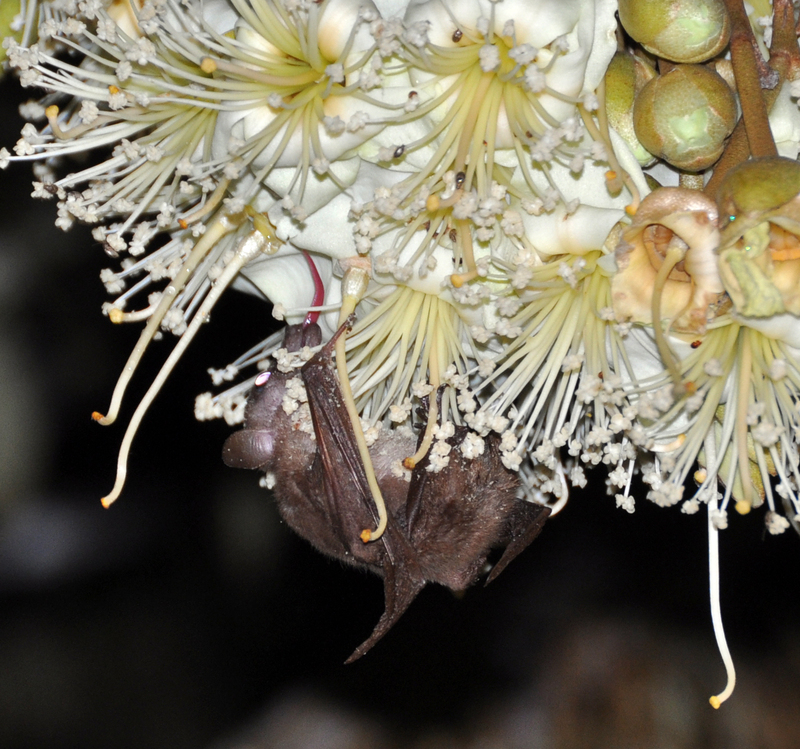 In the photo above you can see large drops of nectar spilling out – no wonder the bat has buried itself in a flower! Allen didn’t realize he had caught one in flight until he looked at the photos on the computer screen. 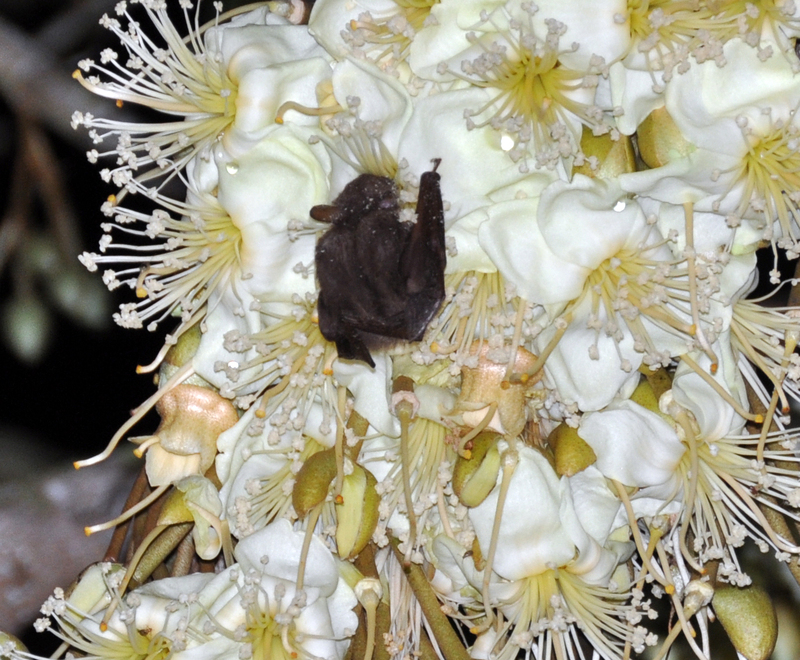 We are fascinated by the tiny muscular ‘arms’ – the bats don’t waste any time when they are feeding, a brief moment on a flower and they are on the move again. All these photos can be enlarged by clicking on them and it is particularly worthwhile in this case to see the detail of the tongue in action. This rather attractive (as yet unidentified) moth was also taking advantage of the plentiful nectar – and the next morning native bees were landing on the carpet of spent flowers lying under the tree, apparently gathering pollen. So while we look forward,with cautious optimism (having had past disappointments), to a bountiful crop of this glorious King of Fruits many other creatures have benefited from the flowers already.